This is absolutely my take on falafel. 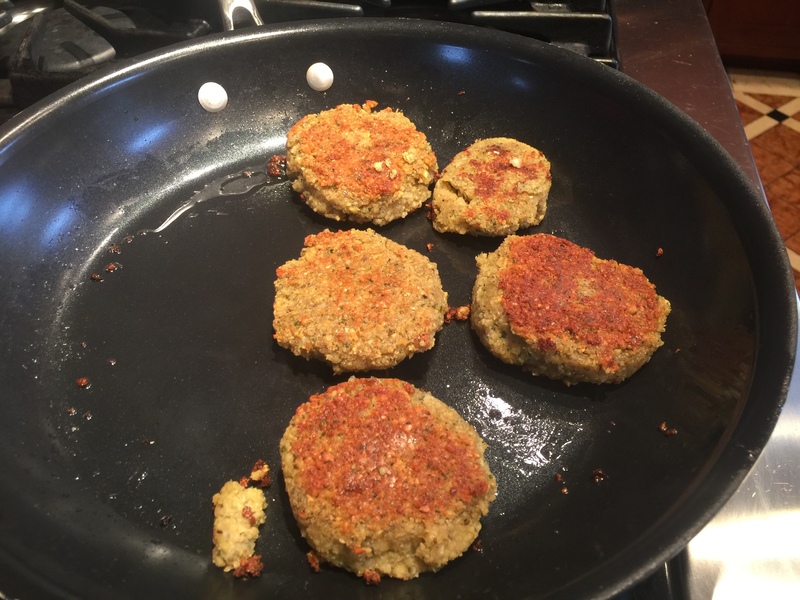 Falafel is a vegetarian patty originally made with either chickpeas, fava beans or a combination of both. Mine is made with chickpeas and is gluten free. Falafel has been around for centuries, and with good reason. High in protein and economical to make, falafel is a great staple to add to your culinary arsenal. Yes, it has carbs, but is high in fiber, and has tons of good vitamins and minerals, especially if you use fresh spices. You will need coconut oil or olive oil for sauteing. To prepare: Put the beans in a bowl or large glass measuring cup and fill with water 4 inches ABOVE the level of the top of the beans. Soak overnight. When ready to make the filling, drain and rinse the beans. You will want 4 or 5 cups of soaked beans. I used 5 cups for the recipe above. Put ALL the ingredients in a food processor and pulse it until it has equalized the size of all the ingredients and looks like gritty paste, but don’t go as far as pureeing it. If it is too dry, you can add 1-2 T of water, but not more. Put in the refrigerator and let the flavors come together for 2-24 hours. This will keep in the refrigerator for 48 hrs. Melt a generous amount of coconut or olive oil in a skillet (I use ceramic non-stick) so that there is a completely covered cooking surface that is ¼ inch “deep”. You will probably need to add more with each batch. Place the flame on medium and warm the oil. When it is ready, form the patties or balls. You don’t want to have to place them anywhere, they should go from forming right to the skillet. (don’t make ahead of time, you’ll read why in next paragraph). Wet your hands and make small patties (or balls) — I find the patties easier to cook and work well on salads as a lunch. They will be “crumbly” as you place them in the oil, but they will hold together better once they cook, but they are fragile, so handle carefully if presentation is important. If they won’t even hold together at all once formed, carefully add 1 T more coconut flour to mixture. Some people add eggs or baking soda, I do not like how that changes the taste. This makes a delicious cucumber yogurt sauce. If you like dill, you may add that in also. I had some greek yogurt that was almost gone, so I made ½ recipe right in the yogurt container. I took fresh mint leaves, stacked them, rolled them up and julienned them into slivers, and added them to the yogurt. Add the rest of the ingredients, stir and serve with the falafel. This meal has protein, fiber, and tons of phyto-nutrients, and will keep you full for hours. Here’s the nutrition facts on the falafel! Note I have not added in the oil, so factor that in.